I have been thinking over the past few weeks about what the new year will be like and what projects I should focus on. 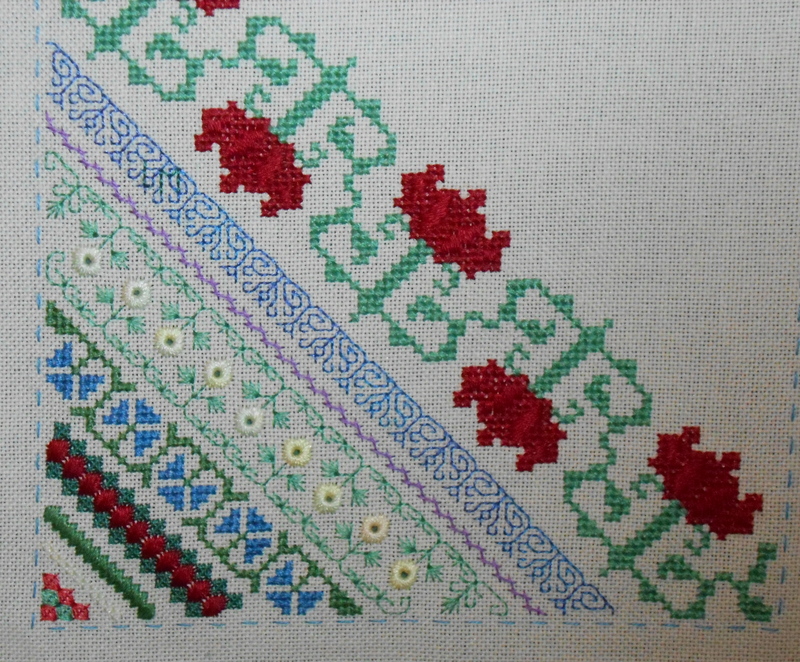 2012 was a total flop for me for finishing all the new projects I started and the WIP stack is near to toppling over. I guess this year I am making a pledge to myself that I will not start any new projects (except the one SAL I signed up for) until I finish at least 2 WIP’s. Stash acquisition I will try to keep to a minimum (we will see how that goes) and use of things in my stash comes first. 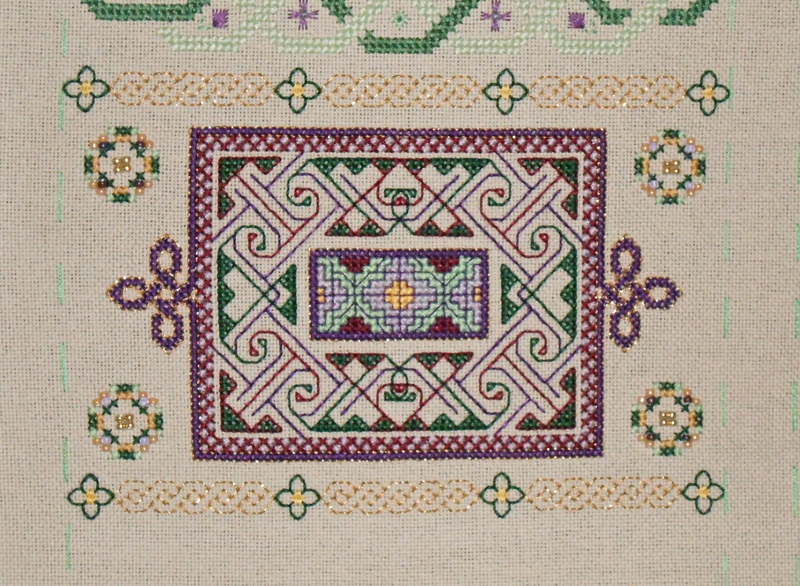 I have multiple large bins stuffed with patterns and I really should stitch some of those before I buy new ones. (The new ones are sooooo tempting though.) 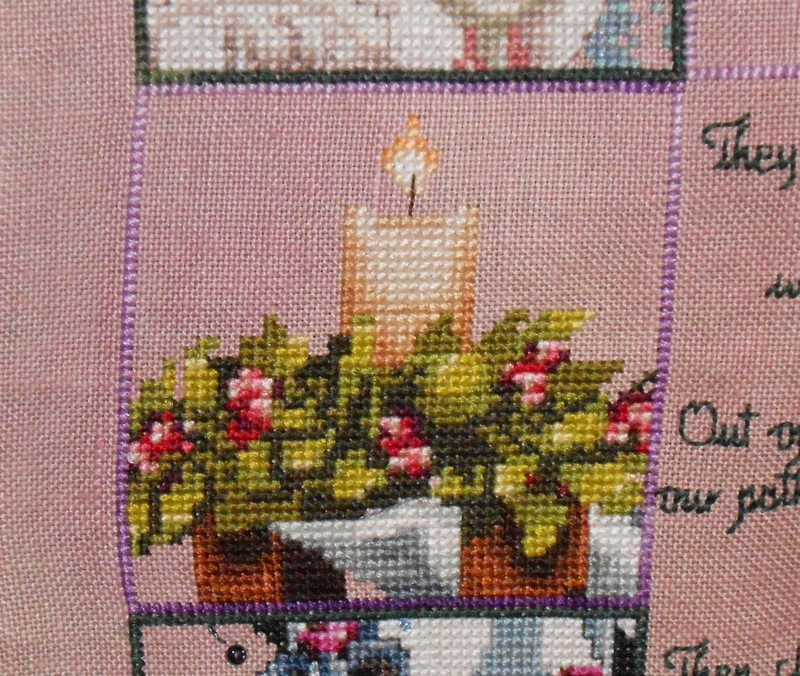 These are my stitching resolutions for 2013. I think this will be my most challenging year!!! 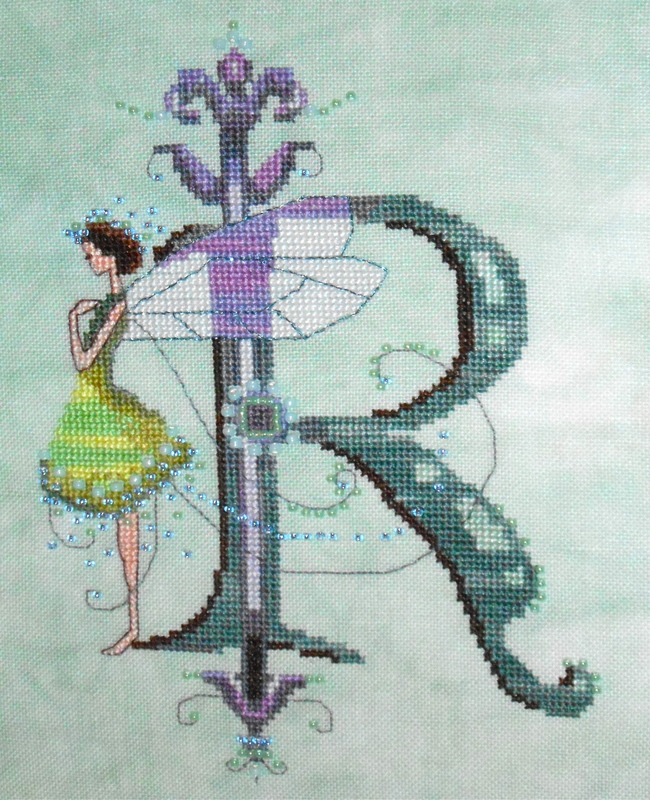 I finished a band sampler RR piece from last year. 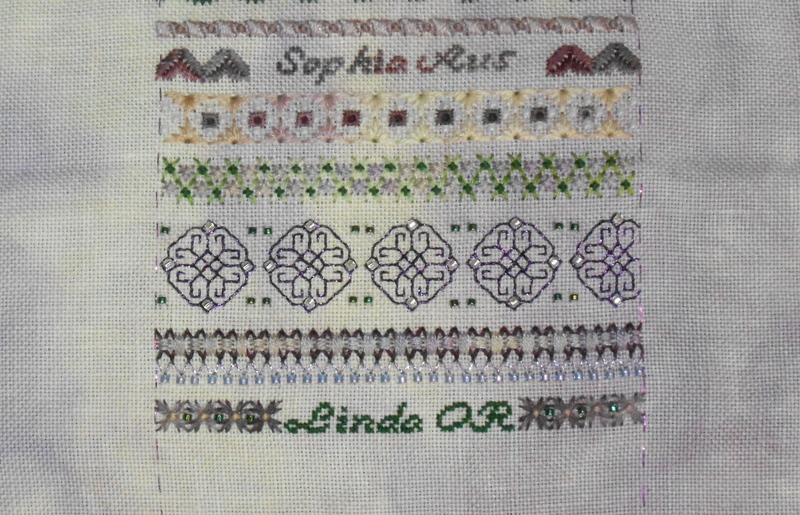 After Christmas will be my time to do the finishing of the Sampler into a bell pull. I just had to add the flowers and birds to the bottom tip area. 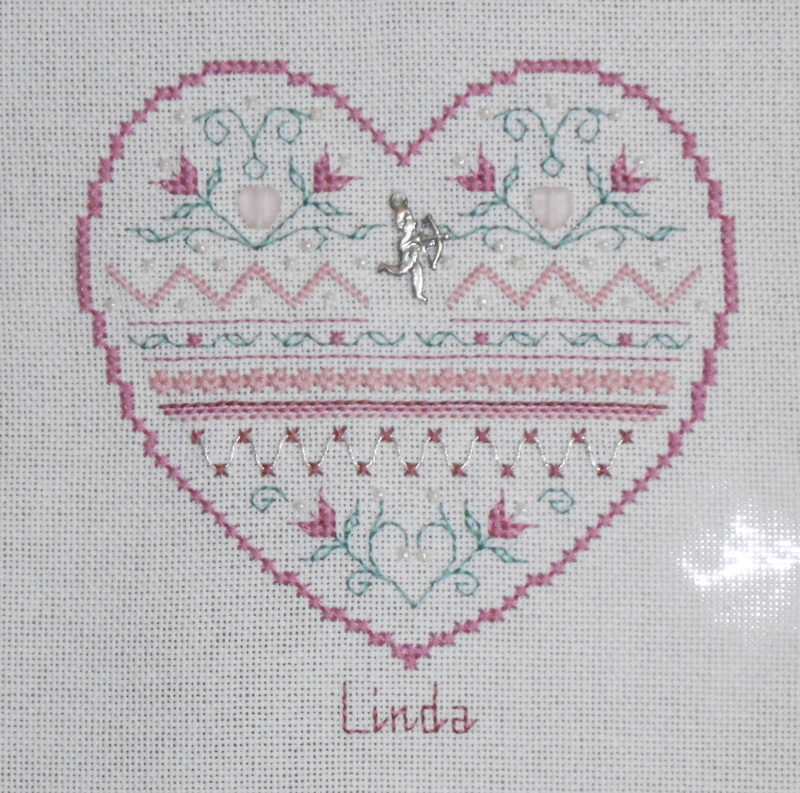 Since there were six stitchers in the group I knew I needed 2 more birds. Instead of 4 fat friends it became 6 fat friends. 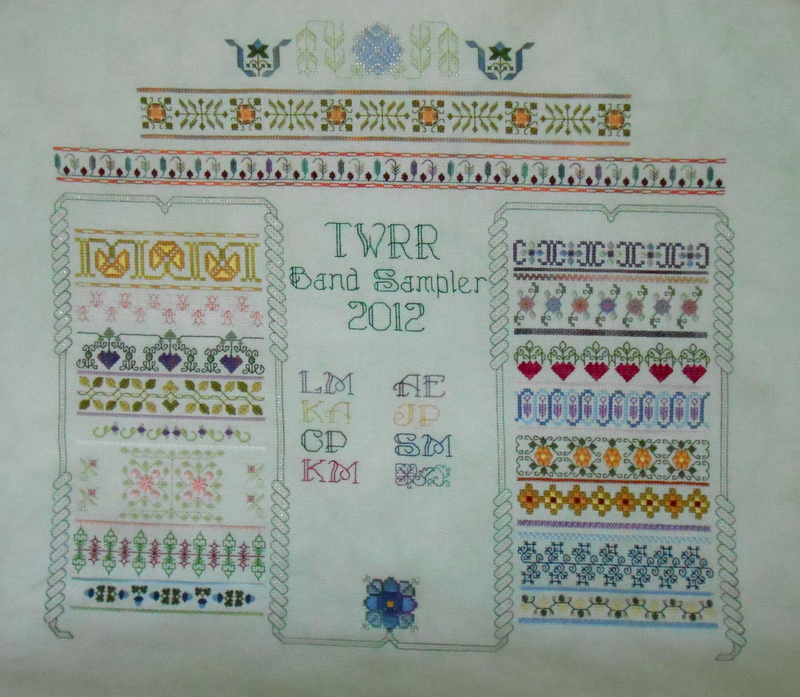 I also worked on another round of the Band Sampler RR for this year. 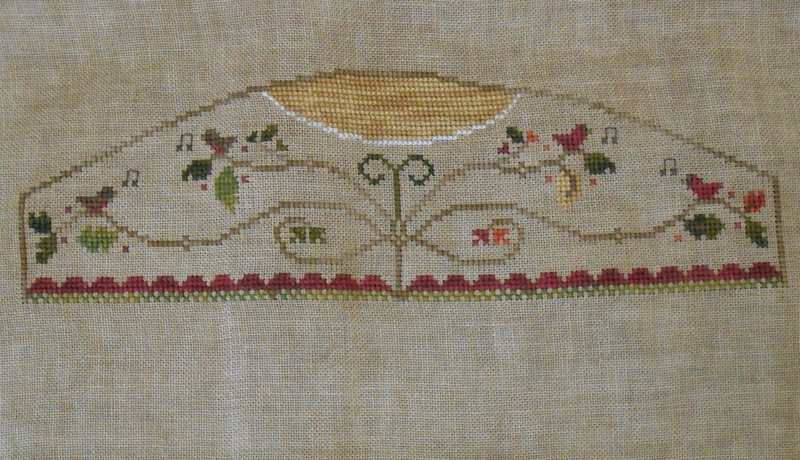 This is for Karen’s Sweetheart Tree Summer Band Sampler. It looks so pretty in person. All the colors are off in my picture. Another girl in the lab that I work at is having a baby. 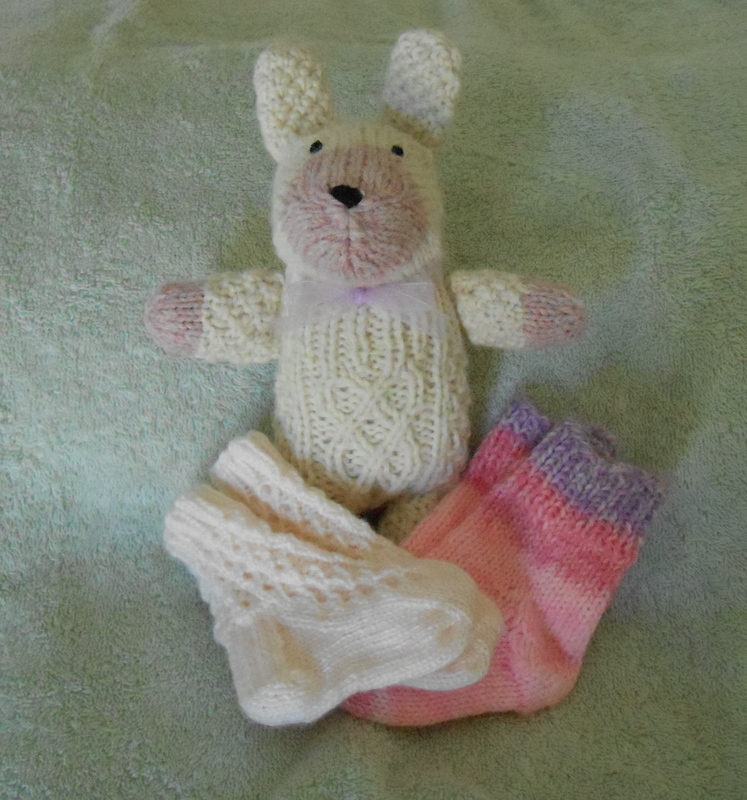 I finished one of the gifts that I am knitting for her. 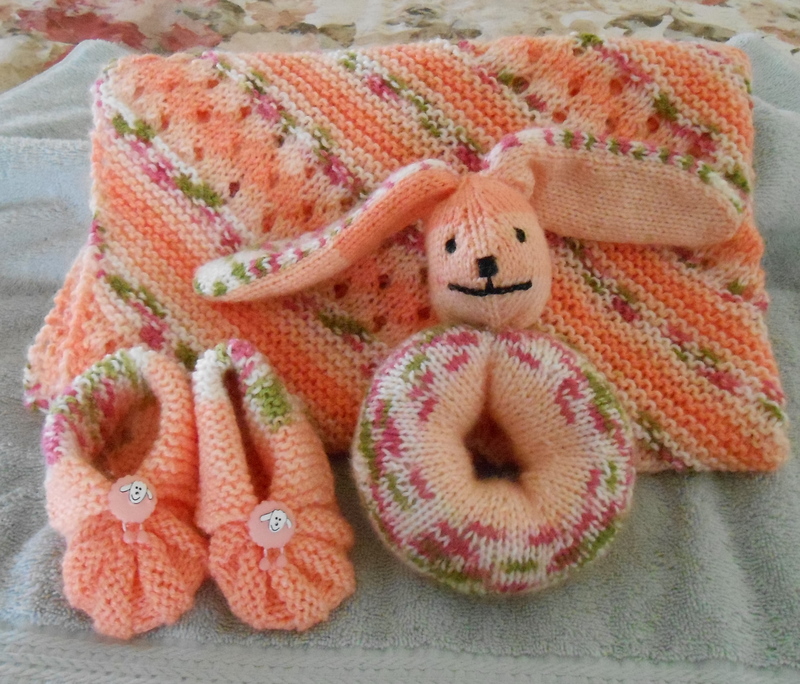 The Rabbit and sweater, the blanket it not quite done yet. I also finished a tunisian crochet washcloth, it is made out of a very soft yarn, Bamboo Silk so it is very soft and drapey. 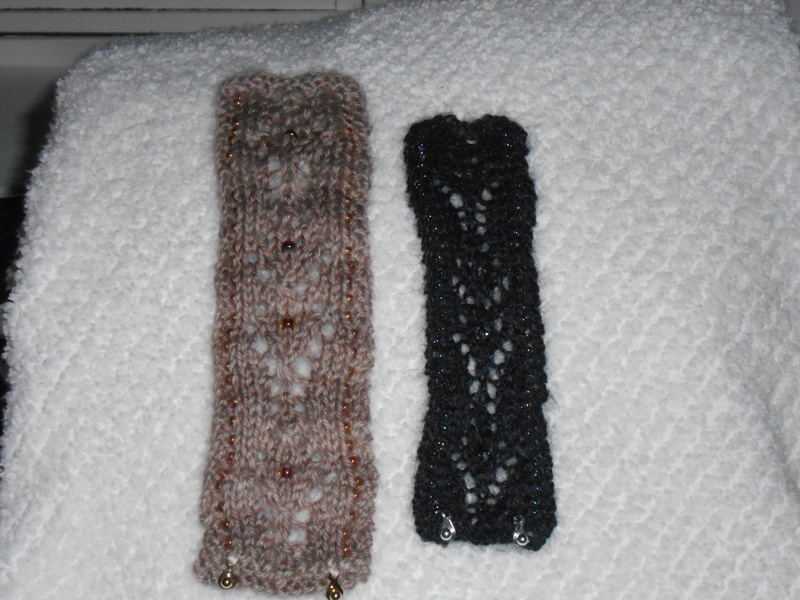 I am just starting to learn some of the different stitches that are part of the tunisian crochet repertoire. I have been crocheting since I was 14 or 15 years old and I never tried this kind of crocheting before. Well I guess it is never too late to learn something new. Well that is what I have finished since the last post. I have been working on a crop sweater for my daughter for Christmas which is about 2/3 done. 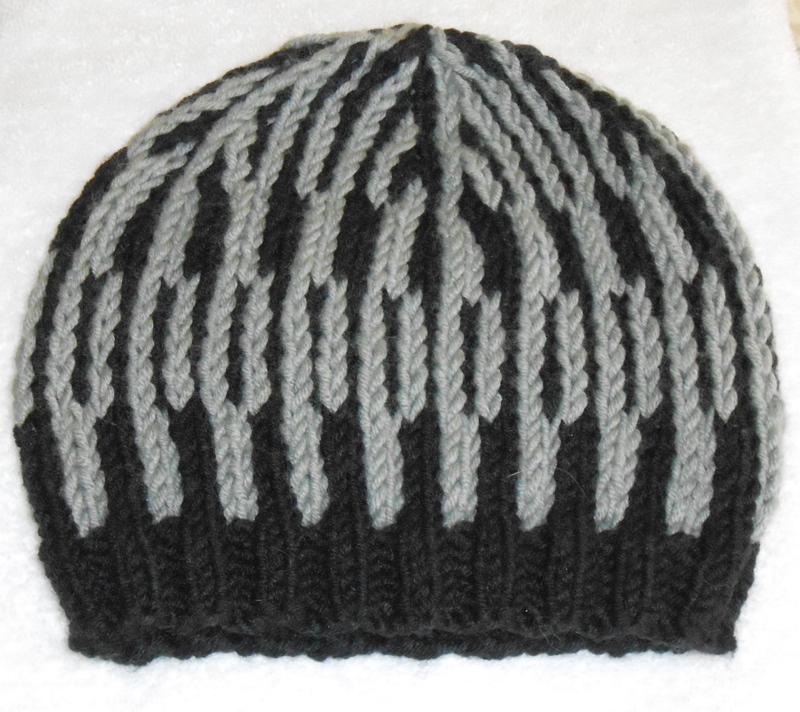 It is a real fast knit although the directions were a bit difficult to decipher until I go used to them. 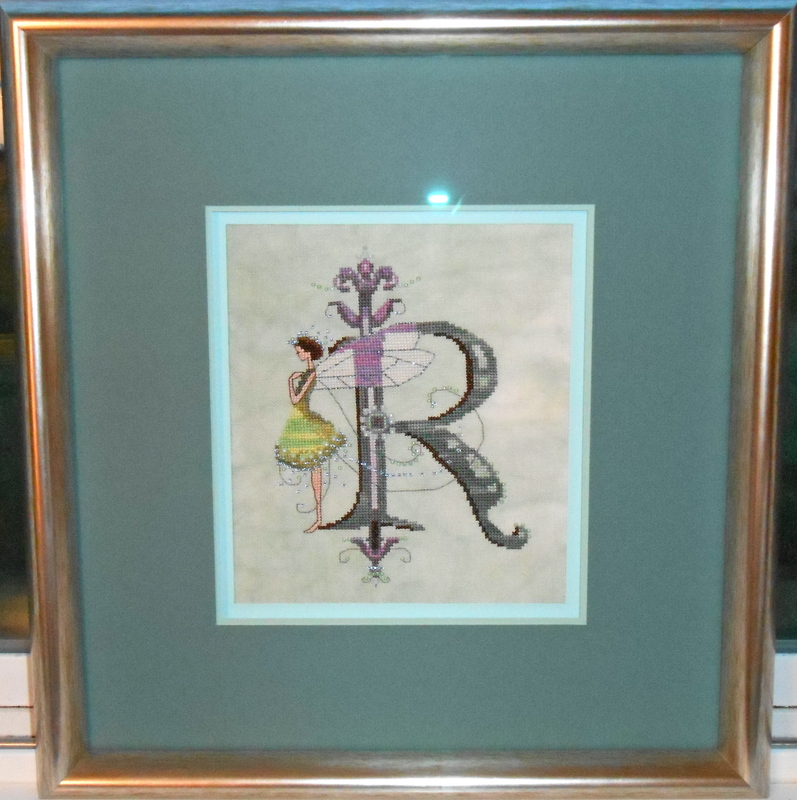 I am also stitching on a project I started way back in January, Nora Corbett’s “R” also for my daughter but she will probably not get this until her next birthday. No new RR’s for the new year. I just need a small break due to some stresses at home and work. 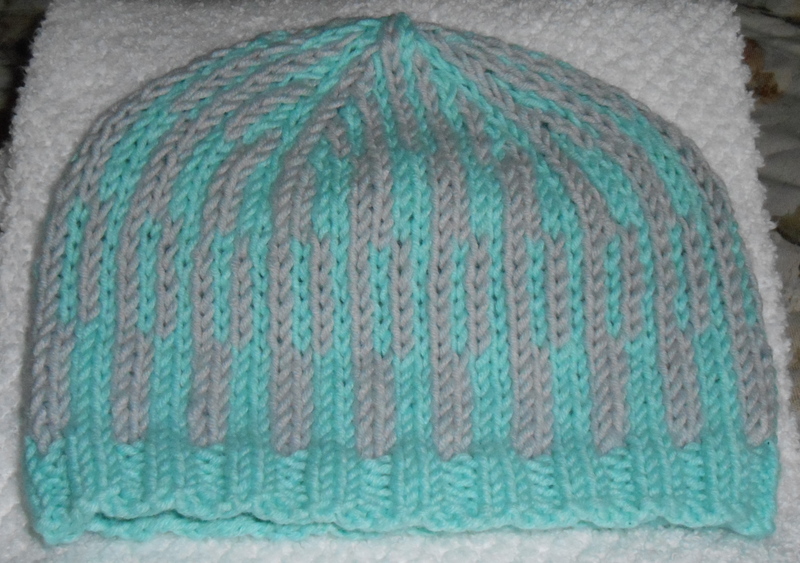 I will try to get more of my own personal stitching, knitting and crocheting done in the New Year. I may get another posting done before the new year, but if I don’t I hope everyone has a Merry Christmas and A Happy New Year. It’s been awhile since my last post. Life has been too stressful and busy and I just did not have the time. This post will have many images, so be patient with me. I have worked on several RR’s in the last couple months. We are now on the last round of the Mira RR for this year. My Mira RR is already on its way home. I can’t wait to see it and finish my parts of the piece. 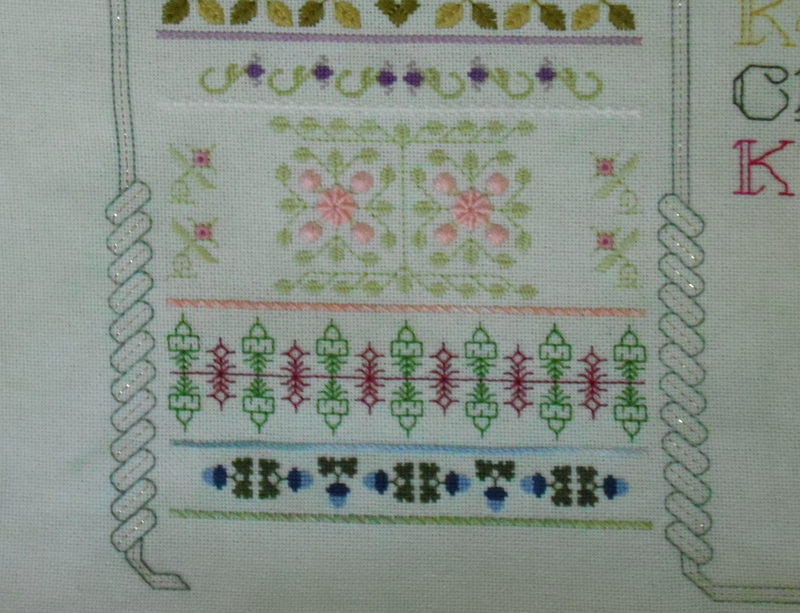 I still have the flower border, the title and finish my Mira Lady (Elizabeth). I will post when it arrives. 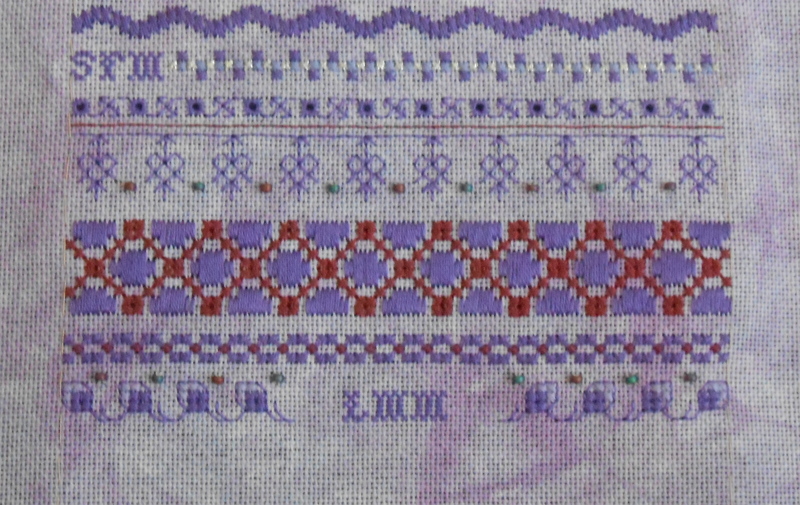 I think we are at least half way through this Band Sampler RR and I am looking forward to stitching on the rest of the Samplers. 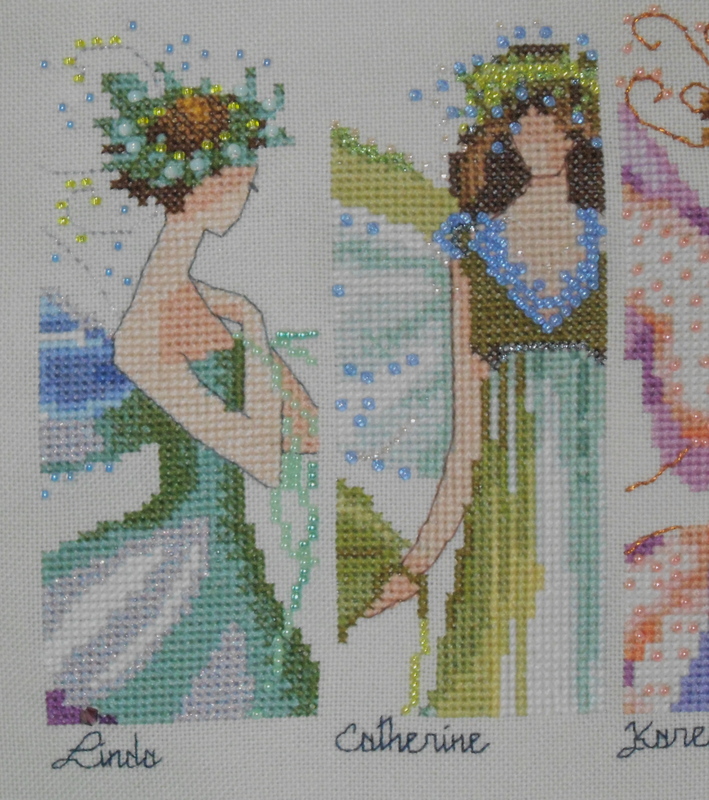 My Time Stitching let me know about. Go check it out. Just click the above links.